Every year, the Henry van de Velde Awards are handed out to Flemish designers and innovators who excel in their field or who have created solutions that impact society in a positive manner. This year, there are 23 winners in eight categories: business, community, consumer, eco-design, graphic and packaging, habitat, health and wellbeing and mobility. 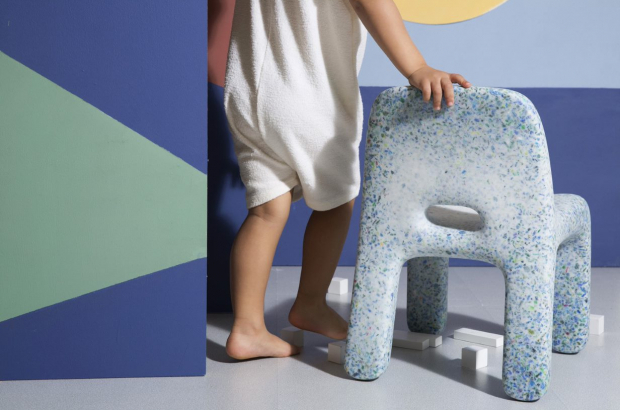 One of the Henry van de Velde Award winners this year is ecoBirdy, which designs and manufactures children’s furniture. But what makes the Antwerp company special is not just the sleek designs, but the materials used to make them. EcoBirdy, an Ovam Eco-Design award winner, gets all of its materials by recycling old children’s toys. The unique design process separates different colours of plastic and eliminates any contamination. The furniture is then made with flecks of the source material showing, giving each piece its very own look. This process also makes ecoBirdy’s entire line of furniture and lighting 100% recyclable. Vanessa Yuan and Joris Vanbriel launched ecoBirdy just a year ago. Since then, they have collected thousands of toys and are more than halfway to their goal of recycling 25,000 kilograms of plastic. Vanbriel, who is Flemish, and Yuan, originally from Taiwan, set out to create something that would help the world instead of harming it. Two years of research taught them that toys were one of the biggest contributors to plastic waste when it came to consumer goods. The reason: an average lifespan of just six months, as children’s abilities and interests shift so quickly. They both started their careers in the fashion industry in Milan, where they met more than 10 years ago. This experience helped them design something that was not just eco-friendly, but also functional and aesthetically pleasing enough for people to enjoy. EcoBirdy products are all available on the company’s website but can also be purchased in the Rewind and Play concept stores in Antwerp’s Sint-Andries district, as well as in shops in Copenhagen, Shanghai and New York. On Tuesday evening, 12 Henry van de Velde Gold Award winners were announced, with one Gold Award winner per category as well as for Lifetime Achievement, Company, Young Talent and the Public. Among the eight category Gold Awards were Modular Lighting Instrument’s suspended light, which can be adjusted in a different direction at any given time, and Barco’s Unisee, a completely redesigned and optimised LCD video wall. The Lifetime Achievement Award was given to Vincent Van Duysen, the world-renowned Antwerp architect and designer, whose broad range of international work includes homes, shops and office, as well as furniture for such brands as Flos and Herman Miller.